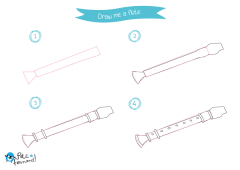 Have your little ones always wanted to start playing an instrument? 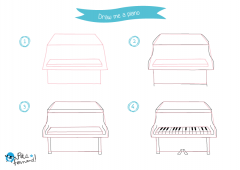 Do you have a little Mozart at home? 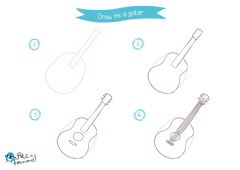 Teach them how to draw all their favourite musical instruments with our super easy tutorial. 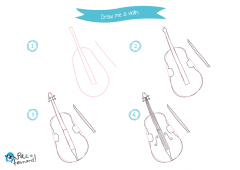 With our free printable drawing tutorials, you can draw drums, a guitar, a piano, a flute, a trumpet or a violin in just 4 steps! If you are looking for more instruments-themed activities for kids, try to make your own homemade tom-tom drum with our easy DIY or check out our cardboard ukulele tutorial to keep your kids busy in the afternoon! Our fourth part of our animal drawing tutorials is finally here to entertain your kids during summer! 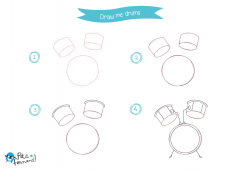 Print out these simple drawing and colouring tutorials for your little ones, so that they can learn how to draw while having fun! Learn how to draw flowers such as daisies, poppies and tulips with our printable drawing tutorials!